I can hold 8 in a $260 NL only auction league. Which 8 do u think? Jose Peraza $8 Starlin Castro 8 Yasmani Grandal 6 Jeff McNeil 1 Lorenzo Cain 29 Eric Lauer 1 Stephen Matz 6 Trevor Williams 3 Alen Hanson 1 Hector Neris 1 Yoshi Hirano 5 Pablo Lopez 1 Franchy Cordero 10 Koda Glover 2. I don’t usually answer such open-ended questions on the site because, well, it seems to me you should do most of the work. That’s why you play. And then hit me with the hard question I might contribute something to. For you, that’s determining your No. 7 and 8 picks. 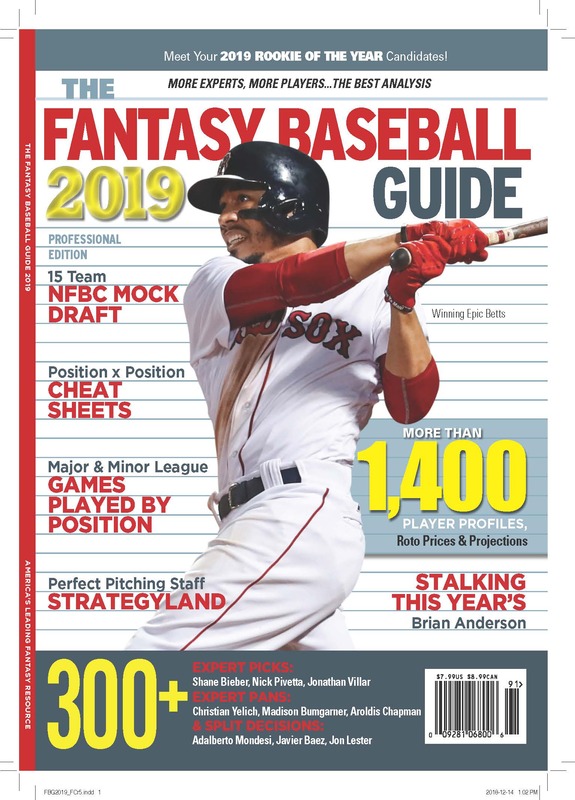 But today is launch day of the Fantasy Baseball Guide 2017 and your question does let me highlight how to decide who to keep. First thing first, there are the big winners: Peraza, Castro, McNeil, and Trevor Williams are obvious keeps. That’s four. Picking off the other four gets more complicated. First off, Yasmani Grandal is at a good price and is looking at a change of scene that might give him a boost. That’s five. Of the remainders, Alen Hanson is cheap. He’s not a great hitter, doesn’t have much power or speed, but he could get a fair number of at bats, and he has some power and maybe a little speed. That’s six. To get to the final two you have to evaluate my prices and your expectations. For instance, if you think Glover or Hirano might close, you have to consider them. At present I do not. If you’re in a pinch you can keep Lopez and Lauer, because they are arms with some talent who might get a chance to play this year. The problem is they’re not going for more than a buck or two on auction day, so these are plays of last resort. Lorenzo Cain is costly, and should go for less than $29 in startup leagues, but what is the inflation rate in your league? If it’s more than 20-percent he becomes something like a bargain. Heck, you might think he’s going to go for $29 in your league, which definitely makes him a bargain. You have to decide if you want to park that money in him, or go after a different outfielder to anchor your offense. He could be your seventh keeper. Or not. I’m personally wary of $33 year old outfielders whose games rely on speed. With each year, the risk of a big failure goes up. Which brings us to Steven Matz or Franchy Cordero. I think $10 is too much for Cordero, but others love him and if you love him you might want to take a chance. FWIW Baseball HQ has him earning $15 this year. I think his contact skills are so bad that, while he could earn $15, he could also be back in the minors in a hurry. Especially because he’s coming off a wrist injury. Which leave us with Matz, who has been injury prone and not that good since his dazzling debut in 2015. I think he’s no riskier than Cordero and cheaper, with the same sort of upside, which is why I would make him my eighth. When you have to make these decisions matters a lot. Health issues and playing time issues will become clearer than mud as the preseason approaches. The longer you can wait the more clarity you’ll bring to your final decisions. But it doesn’t hurt to start exploring the possibilities early.